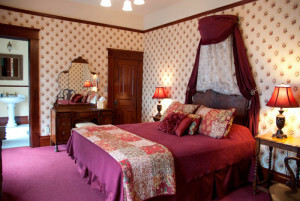 This room offers a Queen bed with a wall canopy and embroidered antique chairs. 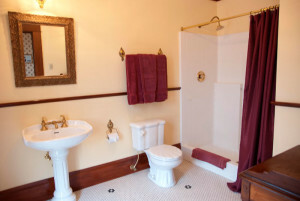 Brightly decorated “western style” in shades of yellow, burgundy and greens; this room has two windows, does not offer a view, but is the most quiet and private of the four rooms. This uniquely tiled private bath provides a large shower with a bench.